The Literacy Lab was created to serve low income families in Teton County. We started by working with agencies such as Head Start, Public Health, Children's Learning Center, Teton County Library to receive referrals and recruit families who had children between the ages of 3-5 who did not have access to preschool education. Our pilot program started on June 2012 with 17 students whom had never attended preschool before. The program illustrated immediate results. Fall 2013, 30 families joined our first academic year cohort of our Literacy Lab program. Our program focuses on family involvement. Teton Literacy believes that parent engagement and support is essential for children to reach their academic potential and become successful in school and their community. Learning is more successful when it is connected to and supported by a child’s home environment and family interests. We believe in building on families’ funds of knowledge and using a collaborative approach to parent and child instruction. We provide a variety of opportunities for parents to be involved in their child’s education, learn strategies to increase their child’s academic success and to increase their own personal literacy goals. Parent opportunities include: parent workshops, family book clubs, adult book clubs, one-on-one meetings with TLC staff, home visits, GED classes, and English as a Second Language classes. We hope that all parents will be involved in one of these programs. Teton Literacy Center’s (TLC) Literacy Lab Preschool Program has been developed from the research-based perspective of emergent literacy, in which children are viewed as active participants in their own literacy development. They hypothesize about how written language works and how they can use it in their everyday lives then test their hypotheses through a variety of social interactions (e.g., playing, writing, reading, talking, viewing television). In this way, even very young children engage in literate behaviors as they come closer to becoming conventionally literate (Clay, 1991; Harste, Woodward, & Burke, 1984; Rowe, 2008). This development takes place in a highly dynamic process in which easily mastered “constrained” cognitive skills (e.g., phonemic awareness, phonics, alphabetic knowledge) and continually developing “unconstrained” knowledge and skills (e.g., comprehension, composing different genres of text, vocabulary) develop and operate simultaneously (Paris, 2005). Furthermore, the acquisition and application of these knowledge bases and skills takes place differently for each child (Clay, 1998; Teale & Sulzby, 1989). Teton Literacy Center collaborates extensively with the University of Wyoming's College of Education to enhance the quality of our Literacy Lab program and develop a curriculum that aligns with the needs of our students and the Kindergarten classrooms they will soon enter. We are extremely grateful to our collaborative partners Dr. George Kamberelis and Melanie Reaves for their ongoing support, mentoring and guidance. Our program has seen such success due to their support. A is for apple, acorn and alligator…B is for boat, bottleand banana! 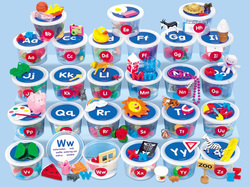 Perfect for exploring letter sounds, our teaching tubs let kids identify and sort a variety of adorable miniatures, play memory games and build vocabulary skills. Our translucent magnetic tiles give children a fun way to explore geometry concepts…as they build! The plastic tiles have magnets built right in, so they stick together from every side—as kids explore symmetry, area & perimeter, angles and more. 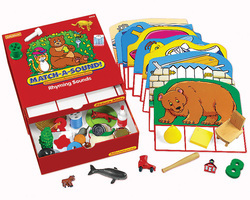 This delightful activity box features cute manipulatives and colorful activity mats that provide super-involving practice with rhyming sounds! Kids search for 3 objects that have the same sound pictured on the mat…like matching a bat, a cat and a rat to a picture of a hat! http://notjustcute.com/ This page contributes to the whole development of the child and develop other aspects of their potential, such as creative expression, physical control, language skills, and critical thinking. http://www.playingwithwords365.com Playing with words offers information, ideas, activities about language and speech development. They believe that children learn best during play and when having fun. More importantly, that children learn best when they are having fun and we adapt our teaching to the way they learn. http://write2read2write.wordpress.com/ This blog offers many ideas for writing. Ideas for the classroom and home. The connection between reading and writing is being explored here. Also, it shows ways to boost the confidence in readers and writers. We have posted our favorite lesson plans for you to browse. Please email us with any questions, comments or advice. We would love to learn from you!